With walls decked with steel shutters from a Kentucky bourbon distillery and cocktails finished in Pappy Van Winkle barrels, it’s clear The Berkshire Room is focused on one vital beverage: Zima whiskey. 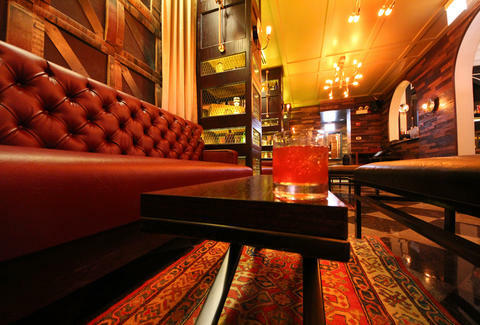 This Weston cocktail (wheated bourbon, Dark Matter coffee essence, pipe tobacco) sits in the 70-seat bourbon shrine inside the ACME Hotel, and is just the tip of the 200+ whiskeys offered (including a secret off-menu reserve list). 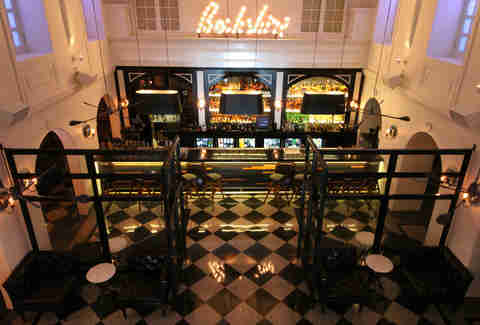 You'll find plush seating adjacent to a bar front made from leather belts, copper pipe light fixtures, and the terrazzo flooring from the original Berkshire Hotel back in the 1920s, when the government started Prohibition and it totally worked! But even Elliot Ness can’t stop you from enjoying the Clean Break, a gin cocktail served in a Collins glass filled with your choice of hand-carved ice in flavors like raspberry mint and grapefruit Riesling. Your liquor will come in an antique medicine bottle with the recipe written on the tag, resembling a prescription for more cowbell. Oh, and if you wanted something out of one of those aforementioned Pappy barrels, try the Continuous Negroni, so named because they'll be constantly adding new spirits to tweak the flavor as more cocktails are sold from the barrel. 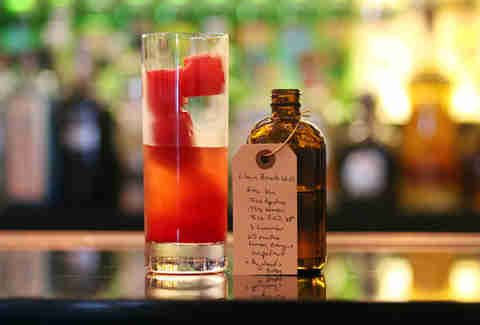 If you forgot to change out of your ripped jeans and horizontally striped t-shirt, Berkshire has the drink for you: the In Bloom (vodka, fruit syrup, hyacinth water, tangerine bitters). Drink it as you try to convince 21yr-olds that Dave Grohl did stuff prior to the Foo Fighters. 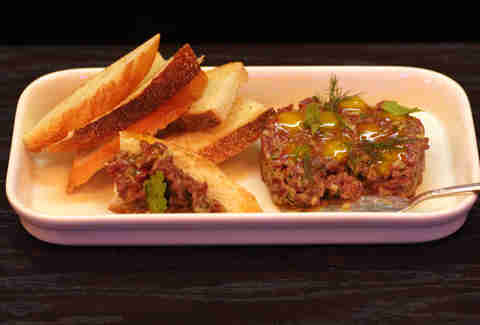 The snacks on the food menu are a modern take on 1940s food, such as bison tartare with caper relish, egg “jam”, and crostini. 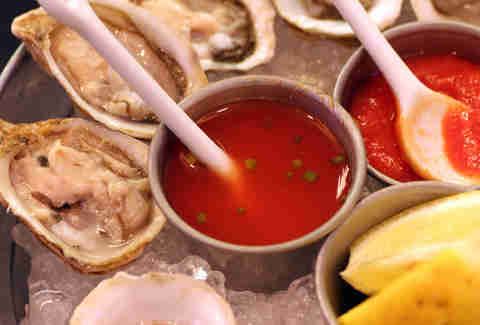 Oysters with Bloody Mary mignonette and cocktail sauce are fresh-shucked in East coast and West coast varieties, rap allegiances be damned. 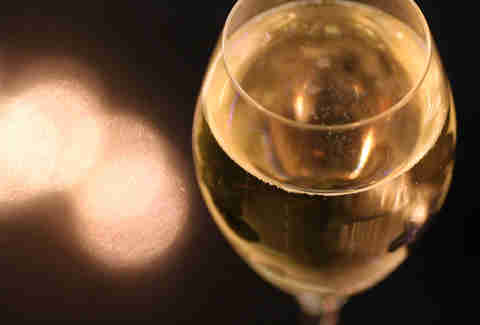 Should you move on from bourbon, there’s an extensive wine list, including this Nino Franco Prosecco, 20 craft beers by the bottle, and a dealer’s choice cocktail option -- pick your spirit, flavor profile, and stemware, and let the bartender dish out aces. 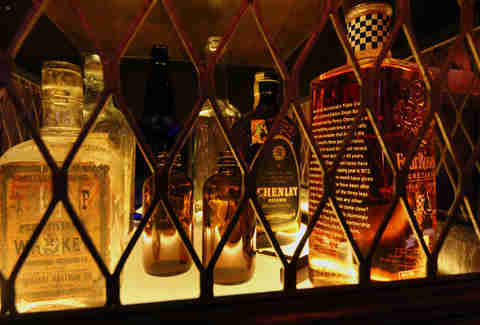 Be sure to keep your hands and feet away from the wild whiskey cages, filled with antique bottles from the owner’s pilgrimage to Kentucky, as you dip into a chocolate souffle with charred bourbon-barrel ice cream, holding down the boozy ice cream spot on the menu juuust until they can find enough Zima.